Inspired by the popular hard rock band, Guns N’ Roses, this music-themed video slot is packed with innovative sounds and high-quality graphics. Developed by Net Entertainment, Guns N’ Roses is presented on 5 reels with three rows and features 20 fixed pay lines. This video slot features a host of impressive bonus features including several different wild symbols, bonus symbols, a bonus wheel feature, multipliers, a free spin feature, and a top paying jackpot bonus worth 750 coins in the base game. The background takes place in front of a massive floodlit stage with thousands of fans crowded around the stage to see their favourite rock band perform some of their most legendary songs. In the bottom left-hand corner of the screen, you will find a set list consisting of five different Guns N’ Roses songs that you can listen to, or you can pick which song to play next while you spin the reels. The reels themselves are presented in front of a black and white Guns N’ Roses logo, and the betting platform received a blue and white colour scheme with the spin button framed in a solid gold ring. The Guns N’ Roses video slot features five high valued symbols including three band members. The band members include Axl Rose, paying the highest jackpot bonus worth 750 coins, Slash paying the second highest jackpot bonus and Duff Mckagan paying the third highest jackpot bonus in the game. The other two high valued symbols include two plectrums that are individually decorated to add to the look and feel of the game. The lower valued symbols include 10, J, Q, K, and Ace presented in solid gold, each decorated with red roses. Guns N’ Roses features a fantastic array of betting options, catering to beginners and slot experts alike. Before you take to the stage and please the fans, you will first need to set your desired betting options. The game features 10 different betting levels with six different coin values. The coin values range between £0.01 to £1.00. The minimum bet you can place on a single spin is £0.20 while the maximum you can bet on a single spin is £200.00. Guns N’ Roses also comes packed with exciting additional features including an Auto Play feature where you can set between 10 and 1,000 automatic spins while you rock out with your air guitar. You can even utilise the advanced auto play feature settings, giving you more control to decide when the auto play feature should stop. In addition, you can use the Max Bet button located on the right-hand side of the spin button to avoid touching the coin values and bet levels, going straight to the maximum bet possible on the game. Lastly, you can enable or disable the sound effects and music if becomes too much for you after a while. The Guns N Roses game logo represents the wild symbol and can randomly appear anywhere except during the Appetite for Destruction feature on reel 3. The wild symbol can also stand in for all standard symbols except the bonus symbols featured within the game. Furthermore, the wild symbol is an expanding wild when it lands on the reels, and the symbols will be changed by the expanding wild symbol except for the overlay wild symbol in Legend Spins, Appetite of Destruction Wild, and the Stacked wild symbol in the Encore free spin feature. The 12’ record with the word ‘Bonus’ written on it acts as the bonus symbol, making an appearance on reels one, three and five and activates the main feature in the game. Encore Free Spins: You will receive 10 free spins and on every spin a Guns N’ Roses band member will make an appearance as an expanding wild symbol on reels two, three and four. Crowd Pleaser: This is a picking game with three levels, and on each level, you will get to pick 3 times. Your goal is to reach a certain amount of coins to advance to the next level. Accumulating 800 coins in all three levels will double your winnings at the end of the feature. In addition, collecting three free spin symbols will award you with 10 free spins. Coin Wins: You will receive a coin amount that will be displayed on the bonus wheel. This is a randomly activated feature in the base game and is presented as a huge cross, appearing in only three possible places on the middle reel. It will stand in for all other standard symbols except the bonus symbol. This is a randomly triggered feature, awarding you with 3 free spins. The first spin will feature stacked wild symbols on reel three, the second spin will feature stacked wild symbols on reel one and five, and the third spin will feature stacked symbols on reels two and four. This is another feature that is randomly activated and occurs after any winning combination. One of the symbols displayed on the reels will be highlighted with a multiplier between 4x and 10x that will be applied to your total winnings. Guns N’ Roses is an excellent addition to the Net Entertainment portfolio, providing realistic animations, exceptional graphics and awe-inspiring music and sound effects. The arsenal of bonus features will keep you rocking throughout the night, and the crowd will cheer you on with every winning combination struck on the reels. Guns N’ Roses is a medium variance slot, giving you a great balance on regular pay outs and decent cash rewards when a winning combination is triggered. The Return to Player has been set to 96.98%, providing a truly fantastic gaming experience with winning potential. 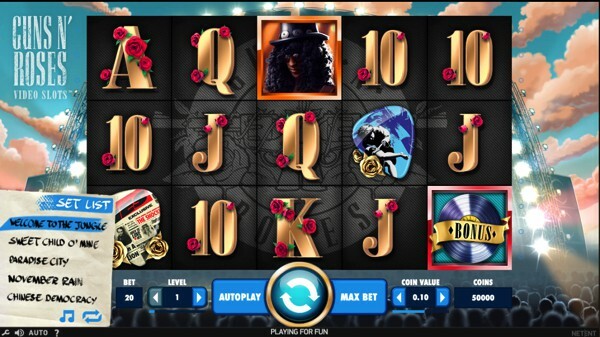 Guns N’ Roses Video Slot has been created by Net Entertainment. The game can be found at casinos like Thrills Casino and Casumo Casino. Play a demo version of Guns N’ Roses slot for free below!